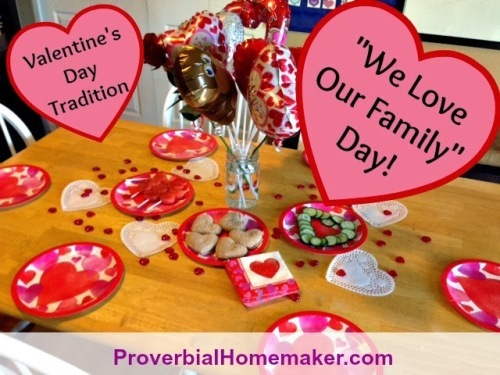 A few years ago our family started the tradition of having a “We love our family” celebration on Valentine’s Day. 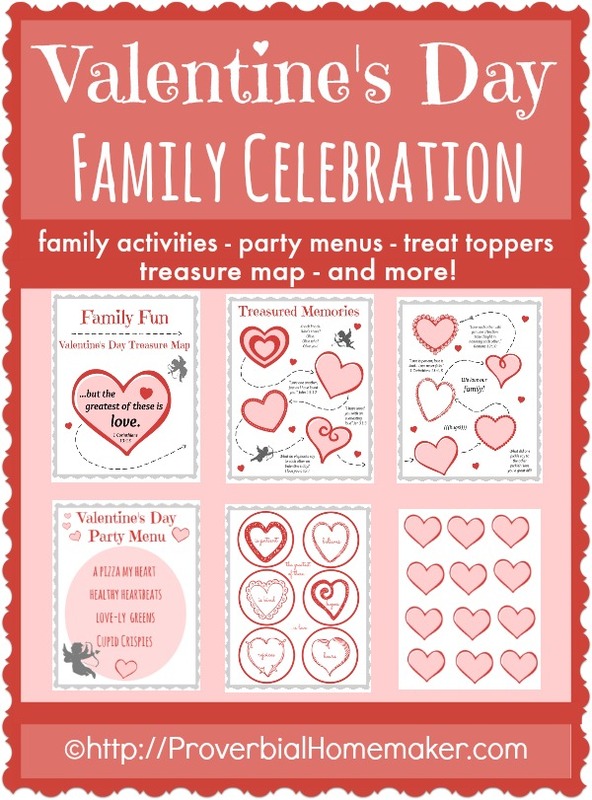 The celebration includes family fun activities using a “treasure map,” a special lunch or dinner, and time spent making memories with the ones we love the most. It’s such a great part of being a family is being able to do these special things that become part of our family culture! We had so much fun with it that we have expanded upon it and are inviting you to join us! The Map. Print the map and glue or tape it in a file folder. The title page is for the outside front of the folder and the two heart map pages are for the inside. You could also just staple the three pages together like a book. Activity Hearts. 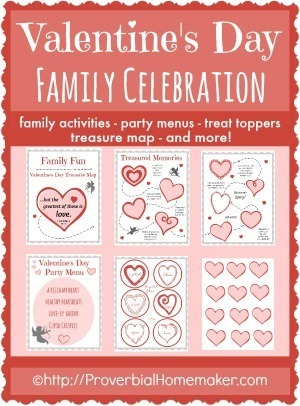 Print and cut out the activity hearts and write in the activities you’d like to do. Then write clues for each activity on the corresponding numbered hearts on the map. You can see we haven’t decided for sure what we’re doing yet. Gluing an envelope on the back to hold the activity hearts helps as well. 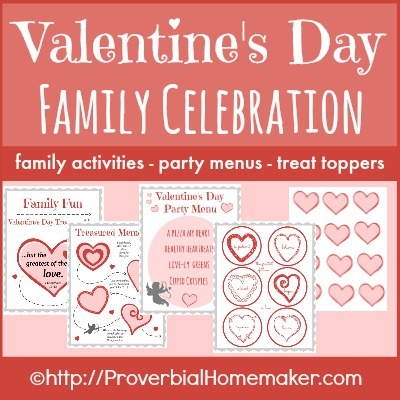 On Valentine’s Day morning, show the map to your kids and begin your fun day together! Read the first clue together and help them brainstorm some ideas. Then present them with the first activity heart for them to tape or glue onto the map. Continue until the map is completed! Last year ours lasted the whole morning and ended with a fancy lunch. Here are just a few ideas to get the creative juices flowing. We plan on using the expanded printables this year for Valentine’s day, and we’ll add pictures when we do! I would love to see pictures of your family’s celebration as well. Use the pre-printed menu or fill in the blank menu with your own choices. Here is what we’re including for our dinner! 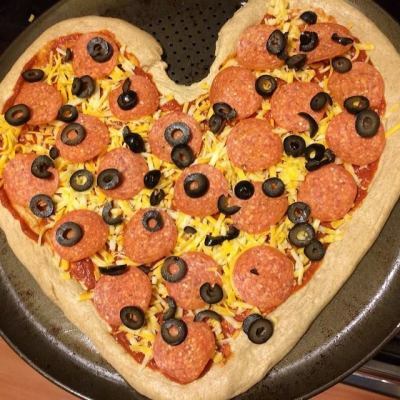 A Pizza My Heart: Heart-shaped pizza, of course! The treat toppers can be printed, cut out, and glued/taped onto toothpicks and stuck into the treats. They also make great cupcake toppers. The hearts each have a different “love is” attribute from 1 Corinthians 13. The heart place cards can be printed for as many family members as you have. For each heart, write the person’s name at the top and then allow family members to write in what they love about that person. They can be the place cards for your Valentine’s Day celebration dinner! I’m trying to download this totally great Valentine’s idea and no link is sent to me to download it? Any ideas/tips? I’ve already checked my spam and others folders. Sorry about that! Be sure to check it again after a bit. Sometimes it takes a little while. 🙂 But I’ll send it if it doesn’t show. Thank you for this! I love the idea of making it a family affair! My husband and I have just never celebrated Valentine’s Day – there’s just so much commercialism and pressure that it kills the romance! So, since high school, we’ve had our special romantic celebration on Columbus Day – no commercialism or pressure there! I will be doing this this weekend with my family Thank you! You’re welcome! We love making it a family event. SO much more fun, in my opinion. 🙂 That’s so funny that you guys celebrate on Columbus Day! I bet you have no problem getting reservations. Thanks for the comment! Let me know how your family celebration goes. I’m having trouble with the download. I requested it more than an hour ago, but is hasn’t show up yet. Maybe it’s the weather or my computer is glitch-y. It does that sometimes. Thank you! It just came through. I really enjoy your downloads, for my own family as well as the children I work with.